[140 Pages Report] The hemostats market is expected to reach USD 3.03 billion by 2023 from USD 2.14 billion in 2017 at a CAGR of 6.0%. The base year for this study is 2017 and the forecast period is 2018–2023. Top-down and bottom-up approaches were used to estimate and validate the size of the market and the size of various other dependent submarkets. The overall market size was used in the top-down approach to estimate the sizes of other individual submarkets (mentioned in the market segmentation—by product, formulation, and application) through percentage splits from secondary and primary research. The bottom-up approach was also implemented (wherever applicable) for data extracted from secondary research to validate the market segment revenues obtained. The major players in the hemostats market include CR Bard, Inc. (US). B. Braun Melsungen AG (Germany), Baxter International, Inc. (US), Integra LifeSciences (US), Marine Polymer Technologies, Inc. (US), Teleflex (US), Ethicon, Inc. (US), Pfizer, Inc. (US), Z-Medica LLC (US), and Gelita Medical GmbH (Germany). The global hemostats market is expected to reach USD 3.03 billion by 2023 from USD 2.27 billion in 2018, at a CAGR of 6.0%. Growth in this market is driven by the increasing number of surgical procedures, growing number of regulatory approvals, increasing incidence of sports-related injuries and spinal ailments, and rising focus on effective blood loss management in patients during surgeries. In addition, the emerging markets and growth in the number of hospitals and surgical centers are expected to offer further growth opportunities for players operating in the hemostats market during the forecast period. The global hemostats market is segmented by product, application, formulation, and region. Based on applications, the hemostats market is segmented into neurological surgery, cardiovascular surgery, general surgery, orthopedic surgery, thoracic surgery, gynecological surgery, urological surgery, and reconstructive surgery. The orthopedic surgery segment is expected to account for the largest share of the hemostats market in 2018. The growing geriatric population, increasing incidence of sports injuries, and the growing prevalence of lifestyle disorders (such as arthritis, osteoporosis, and obesity) are some of the major factors responsible for the growth in the number of orthopedic surgeries performed globally. The growing number of orthopedic surgeries is in turn expected to support the growth of dependent markets, such as the hemostats market for orthopedic applications. Based on product, the hemostats market is segmented into thrombin-based hemostats, oxidized regenerated cellulose-based hemostats, combination hemostats, gelatin-based hemostats, and collagen-based hemostats. The thrombin-based hemostats segment is expected to account for the largest share of the market in 2018. The large share of this market segment can primarily be attributed to the wide range of advantages associated with the use of thrombin-based hemostats. 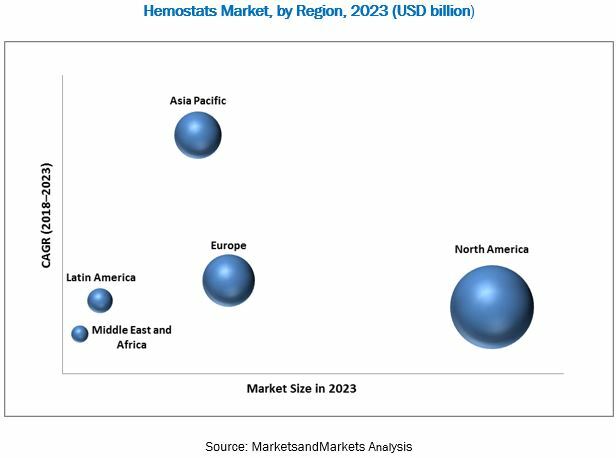 Based on formulation, the hemostats market is further segmented into matrix & gel hemostats, sheet & pad hemostats, sponge hemostats, and powder hemostats. In 2018, the matrix & gel hemostats segment is expected to account for the largest share of the hemostats market. 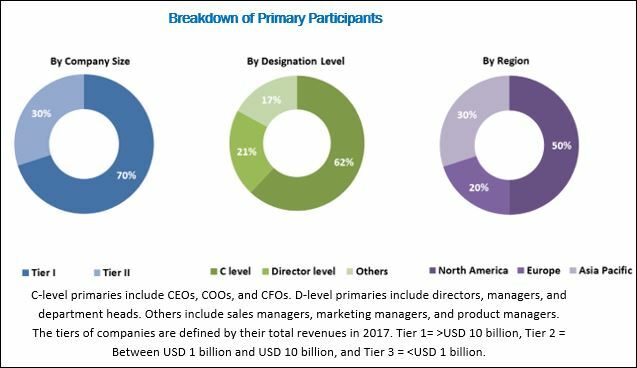 The large share of this market segment can primarily be attributed to the advantages associated with the use of these formulations, such as lightweight and ease of use. Sponge hemostats, on the other hand, are expected to witness the highest growth in the market during the forecast period. Market growth can largely be attributed to the growing acceptance of these formulations by end users. On the basis of region, the hemostats market is segmented into North America, Europe, Asia Pacific, Latin America, and the Middle East & Africa. In 2018, North America is expected to account for the largest share of the global hemostats market. The hemostats market in North America is well-established, with the US being a major market in this region. Growth in the North American market is majorly driven by the growing geriatric population and increasing number of surgeries in the region. APAC countries, particularly China and India, are expected to offer significant growth opportunities for market players in the forecast period, primarily due to improving healthcare infrastructure, growing medical tourism, and increasing number of elderly people in the region.